If you’re looking to invest in a quality set of bi folding doors, you should look no further than Clear View – the leading choice for bi fold doors Castleford can trust. For many years, we have manufactured, supplied and installed windows, doors, roof systems and orangeries that set the standard throughout the industry. Whether you’re looking to replace your existing doors or integrate a set into a new-build, we’d love to hear from you. Call us now on 0800 1357 167 to find out more. Here at Clear View, we take pride in providing a range of doors, windows, roof systems and orangeries that utilise the highest quality materials. Each one is manufactured in-house by our team to the client’s exacting specifications. The beauty of bi folding doors is that they provide a clear opening space of up to 90%. This will open up your living space and provide a seamless transition to the outdoors. Sound like a great idea? If so, call us now and discover the finest bi fold doors Castleford has seen. The first step is to contact our team and arrange for a time for us to visit your home that is convenient for you. Our Castleford bi fold doors open in a concertina style in which the doors fold up neatly. As such, we won’t necessarily have to take into consideration the space available to you outdoors. What we will do, however, is take accurate measurements of where you plan to have the door installed. We prefer to take our own measurements as this helps to minimise the chance of any errors occurring. Not only does this relieve you of any accountability, but it’ll also help to minimise any costly delays. Once we have the measurements we need, we will discuss colour options and recommend the most suitable bi folding door configurations for your bi fold doors. Castleford, once we’ve completed this initial survey, you’ll be supplied with a fully itemised quotation. Once you’ve agreed to our quote, your doors will be manufactured by us in our purpose-built factory. We offer fantastic lead times, so you won’t be kept waiting for your doors to be finished. Once fabricated, they’ll be carefully transported to your premises and installed by our professional bi fold doors Castleford team. If you have any questions or would like more information about our Castleford bi fold doors, call Clear View now on 0800 1357 167. 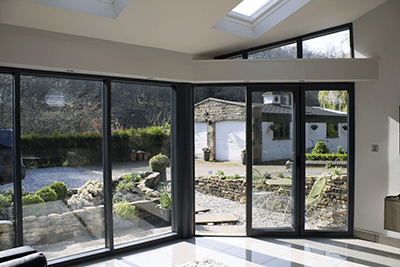 Why Choose Clear View for Bi Fold Doors Castleford? Here at Clear View, we hold ourselves to standards so high, other companies often struggle to compete. The secret to our success lies with our manufacturing methods which enable us to maintain the highest standards of quality control. Not only that but also, all our bi fold doors in Castleford are fabricated using thermally broken aluminium. This ensures the best strength, versatility and aesthetics for a door that will stand the test of time – and look great while doing it! Our clients will enjoy effortless operation, reliability and security that cannot be surpassed. What’s more is that aluminium contracts and expands far less than other materials, making it a great choice for thermal efficiency. Our products are also future-proof as they are built to a standard that surpasses all current building regulations. 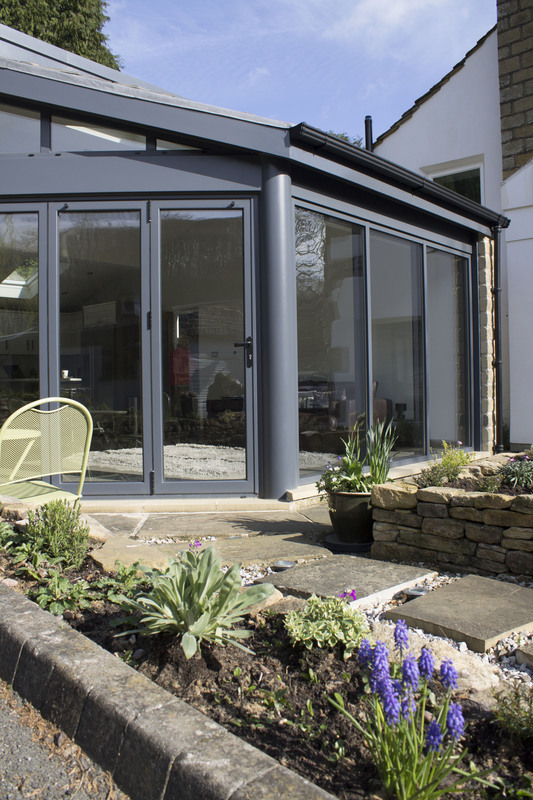 By choosing bi fold doors, Castleford residents can benefit from an increased glazed area. This is because aluminium frames can be built a lot more slender than other alternatives, including uPVC. 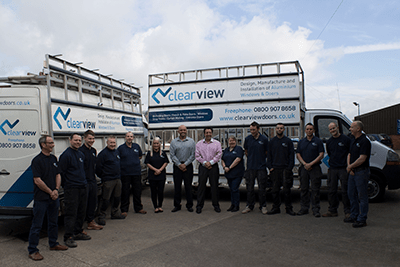 Here at Clear View, we have ten years of aluminium industry experience along with a 9,000 square foot workshop and state-of-the-art manufacturing facilities. Whatever your requirements, we can handle them and with 200 powder coated colour options available, we can customise Castleford bi fold doors to any scenario. So, if you’re tired of searching around elsewhere for the best bi fold doors Castleford can offer, it’s about time that you got in touch with Clear View today on 0800 1357 167.